These days, we tend to take for granted that the canned goods we buy at the supermarket are, more or less, safe. Of course, we have all been warned of the dangers of eating the contents of tin cans with swollen lids (botulism), or any can, which is damaged to the extent that the integrity of the contents has been spoiled. According to several sources, the tin canning process was developed by a Frenchman, Philippe de Girard, although others may have been working on the concept earlier. De Girard later went to London to patent his idea to an agent, Peter Durand. Durand apparently did not pursue the idea himself, but, in 1812, sold the patent to Englishmen Bryan Donkin and John Hall. They refined the process and established the worlds’ first commercial canning factory, in London. By 1813, they were producing their first canned goods for the Royal Navy. Although in use shortly after 1813, tinned preserved food was still considered to be a relatively recent innovation in 1845. In England, the promise of extended expeditions was now feasible and tinned food would allow arctic explorers to winter successfully in the Arctic with an ample supply of tinned, preserved food. 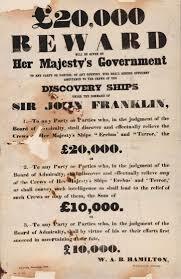 And so, thus began the voyage of the ill-fated Franklin Expedition. 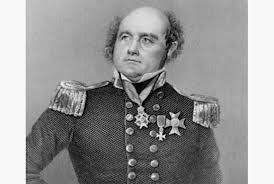 Sir John Franklin sailed from England on May 19th, 1845, with 134 officers and men, on two ships: the HMS Erebus and the HMS Terror. 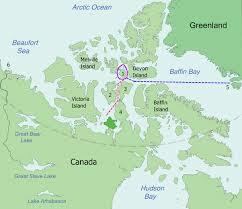 His orders were to sail to the Canadian Arctic, specifically, Baffin Bay and Lancaster Sound and then, via the Bering Strait complete a Northwest Passage and link the Atlantic and Pacific oceans via the Canadian Arctic. In addition, he was to collect valuable scientific and geographical information. The ships were lavishly outfitted with not only food supplies, but a hand organ, mahogany writing desks for the officers, instruments for geology, botany and zoology, school supplies to train illiterate sailors, china, a 2,900 volume library (divided between the two ships), cut glass, Victorian silver, even a camera (the first such expedition to have one). The main food supplies included flour, liquor, “wine for the sick”, “concentrated spirits” (i.e. brandy), chocolate, tea, lemon juice, dried fruits, etc. and large quantities of tinned food: 15,664 pounds preserved meat , 10,452 pints preserved soups, 7,839 pounds preserved vegetables and 2,613 pounds preserved potatoes. The provisions were to support the entire crew for 3 years. This did not include personal provisions. 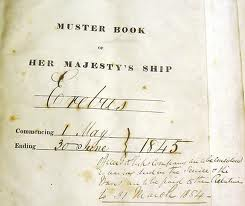 At the end of July, 1845, the Erebus and Terror met two English whaling ships in Baffin Bay. In early August, the Erebus and Terror set sail again. It was their last contact with the outside world. They would never return. 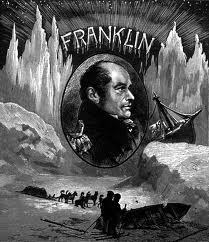 After no further contact or news of the Franklin Expedition, finally, in 1847, the British Admiralty in London set out three expeditions to locate and relieve Franklin. In addition, notices were posted in the Toronto Globe newspaper, offering rewards for anyone who was able to locate the expedition. As Owen Beattie, a Canadian anthropologist, says in his book “Frozen in Time” …the failure of all three relief expeditions “…finally sparked a recognition that something might have gone terribly wrong”. By 1850, a fleet of ships were combing the area and several pieces of wood were located on Victoria Island, wood, which could only have come from a ship. More debris was located, as were the graves of crew members William Braine, John Hartnell and John Torrington. The remains of tent sites were also found. Later search vessels were sent out in 1851 and 1852 and as early as 1852, there was some suspicion cast of the quality of the expedition’s food. The three graves, located by one of the relief expeditions, were those of very young men, who apparently died in the first year out, in early 1846. In addition, the supplier of the tinned foods to the expedition had since had problems with spoilage. 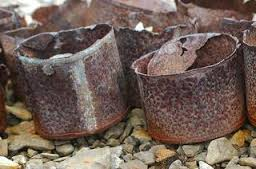 In the rush to fill the order for the Franklin Expedition, the supplier had packed some items in larger tins than originally ordered, which might have compromised the contents if the cooking time had not been adjusted. Additional human remains were found in these expeditions, as well as notes, relics and goods and a small boat, launched from one of the ships. Strangely enough, the goods in the boat included silk handkerchiefs, scented soap, books, sponges, slippers and combs. The only food located was tea and chocolate. Beattie and his team of anthropologists and archaeologists, working from 1981 through 1985, excavated the graves located previously and also found more indications to trace the voyage of the Erebus and Terror, which painted a trail of death and devastation. The frozen bodies were later autopsied and examined and one of the key things located was a very high incidence of lead in the tissues and bones, far exceeding what would have been expected. Additional research and analysis suggested that Sir John Franklin and his crews had likely not perished due to starvation or scurvy, but from the ingestion of the lead from the tin cans. According to notes about the expedition, each sailor would have been allotted a continuous supply of tinned food, resulting in the ingestion of a steady accumulation of lead. Lead ingestion can cause poisoning, compromising the body and permitting diseases to gain hold, therefore killing off the host. However, lead poisoning also causes fatigue, weakness and paranoia, which might have been exacerbated by the harsh conditions. It is known to cause disturbances of the central nervous system, producing neurotic and erratic behaviour. More recent studies link lead ingestion to various forms of dementia. It should be noted that some of the bones recovered by Beattie also demonstrated evidence of cannibalism. The confusion and paranoia caused by the continuous ingestion of lead from the faulty tins is thought to have clouded the judgment of the expedition crew. As Beattie points out in “Frozen in Time”, “Only clear minds in control of situations can hope to make correct decisions”. Taking scented soaps and silk handkerchiefs on your last ditch attempt for survival, and minimal food stores, is not the most logical nor common sense way to give yourself a fighting chance. Some discussions over the years have suggested that Franklin’s crew, after the ships became frozen in ice, left their ships taking with them silver tea services and the like, abandoning most of the food stores. 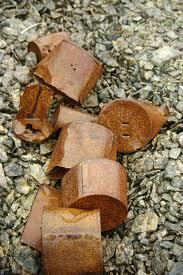 Some authors have disputed the lead poisoning theory, but according to the analysis and putting the puzzle pieces together, lead poisoning is the most likely reason, although as Beattie notes, it was probably a combination of things that caused the crew to perish. In addition, the early sealing techniques of the tins may have resulted in poor cooking times, causing bacteria to grow and causing possible food poisoning as well. Thus, the next time you go to your grocery store and pick up a can of Campbell’s Pork and Beans, think of the crew of the Franklin Expedition of 1845. 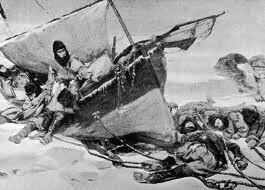 They presumed that their food stores were safe and would see them through the harsh Arctic months of exploration. They could not have foreseen the tortuous and probably painful journey they were about to make, which would end in a horrific disaster with no survivors. And it most likely began with that humblest and most common thing we all have on our kitchen shelves: the tin can. 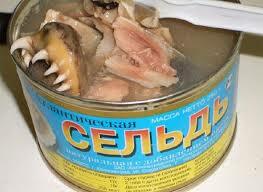 Canned Russian Herring is the caption. It just goes to show that the consumer must be ever vigilant. Quality control can slip up on occasion! This entry was posted in Cooking, Cooking Technology, Eating, Uncategorized and tagged Cooking, English Cooking, food history, Franklin Expedition, Frozen in Time, Lead Poisoning, London, Northwest Passage, Sir John Franklin, social history, time capsules, Tinned Food. Bookmark the permalink.